Ed. Note: Welcome to the third of our four "Anime Secret Santa Reviews." Our reviewers were given review requests as gifts from their Secret Santas, and are now unveiling their opinions of the shows they chose. For more information, check out our 2010 Anime Secret Santa introductory post. 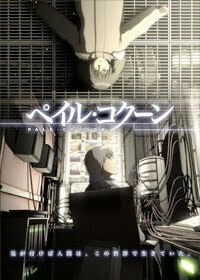 Pale Cocoon is a short (under 25 minutes), OAV by Yasuhiro Yoshiura that seems to mainly serve as an animation and concept demonstration. The story itself is quite simple, despite being told through vague, psuedo-deep dialogue. The message is one many would describe as "moving" or "profound," but all I saw was tiring environmentalism and juvenile artsy writing. Also, the dialogue is bland and the pacing needlessly drawn out. As a reader of magazines like Galaxy Science Fiction and Asimov's Science Fiction, I certainly enjoy a good piece of SF short story, but Pale Cocoon's premise lacks the impact it should have. From a social SF standpoint, the environmental aspect of humans being driven away from the Earth due their own mistakes is a dime-a-dozen plot that has been much better done elsewhere. As a character drama, the two protagonists seem like they could be interesting, but not enough depth or background to their relationship is present for me to feel emotionally invested. Despite an interesting SF concept, it needs a lot more fleshing out to be enjoyable. In the future, human society has been forced underground by environmental destruction. Archeologists have now dedicated themselves to archiving and researching photos and other documentation from the surfacebound past. Photographs of a green, living earth captivate the protagonist of the story, while everyone else is questioning the necessity of the historical discovery and feel as if it is better if humanity doesn't know what it was once like. Despite his female friend encouraging him to abandon his work, the protagonist discovers an old music video that compels him to seek the truth about the human race's previous life. My issues with the plot are largely irrelevant since the entire OAV is a technical demonstration, but as a vessel for displaying Yoshiura and the studio's animation talent it succeeds quite well. The animation is gorgeously detailed with intriguing cinematography. The aesthetic is built around, well, technology looking cool, and as such it features lots of detailed shots of wires, pulsing light towers, computer desktop screens, and related. 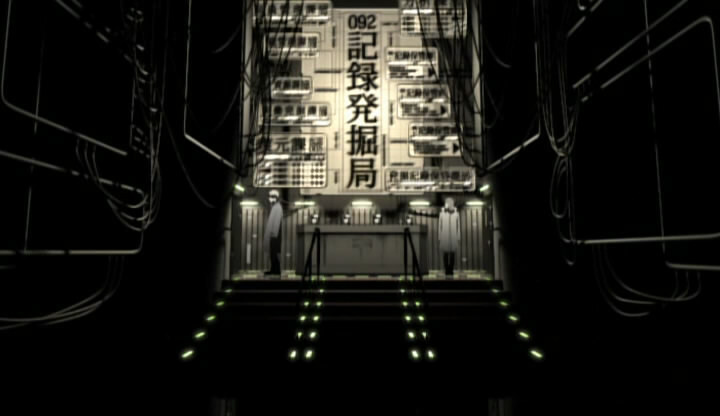 Naturally, it is impossible not to make the obvious Serial Experiments Lain (1998) comparison with its technical, cyber-cool focus. Interesting camera angles and panning may serve as animation shortcuts at times, but are effective stylistic choices at others. Aside from the amateurish character designs, Pale Cocoon is a strong demonstration of atmospheric, technological animation. It is easy to compare it to Makoto Shinkai's Voices of a Distant Star (2002), as both are these are short works that showcase the director's budding talent. 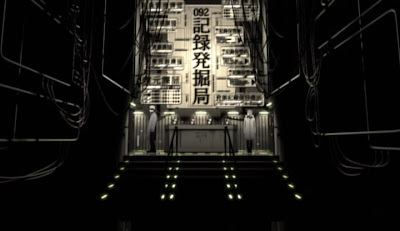 However, since Pale Cocoon is a studio production, it features better quality animation that Shinkai's home made effort, but there is a similar spirit between the two. In fact, both manage to pull off a "Macross" by using cheesy pop music to reinforce a climactic scene. Voices of a Distant Star, however, executes a very effective character drama built around strong SF themes, whereas Pale Cocoon's plot comes off as mere structure to show off pretty graphics. If not for the Secret Santa recommendation, I would not have even bothered to review Pale Cocoon. I see it as a piece of experimental filming, used as practice for the director's "real" debut. Reviewing it seems equal to browsing through an accomplished director's early archives and giving criticism on their practice projects. I can understand commenting on it when it was first released, but now it should be left alone and treated only as historical documentation. Where Pale Cocoon succeeds is in whetting the appetite for future projects from the director. Despite its flaws, Pale Cocoon has attracted a surprising amount of enthusiastic viewers. With its short length and ease of access through Crunchyroll streaming, it requires no significant commitment. I believe that it also represents anime fandom's interest in good science fiction anime, and people watch it in hopes of filling a void. Thankfully, Yoshiura went on to release Time of Eve (2008) that uses even better animation with similar elements and overall vibe. Time of Eve is a strong science fiction series that has the appeal that Pale Cocoon only hints at. I would recommend skipping out on Pale Cocoon, and diving straight into Time of Eve. Pale Cocoon could then viewed as a piece of historical interest to fans interested in the director's developing ideas. This review is based on the Crunchyroll stream of the series, provided by Studio Rikka.